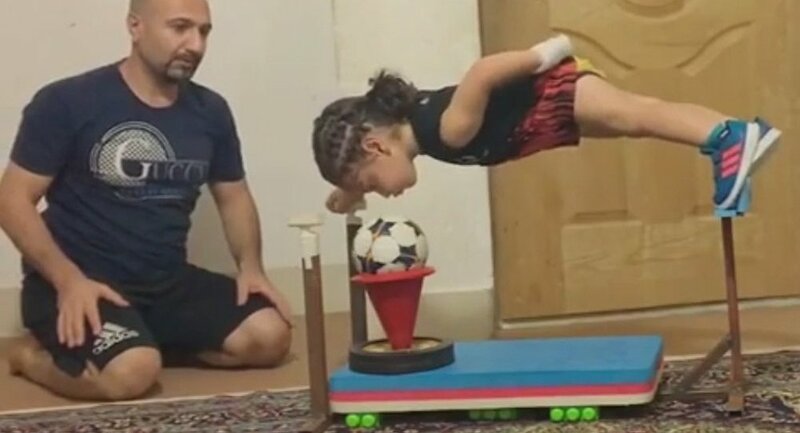 The 3 year old Iranian wonder kid has stunned millions on this planet over several social media platforms and has left many awestruck – Arat Hosseini, has left people awestruck with his gymnastic kicks, flips and balances. A lot of people believe what Arat does is no less than magic and that he possesses qualities of that of a textual superhero, the ones we read in books and watch in movies. Batman, Superman, Ironman, Krish or Shaktiman, who is this kid an epitome of? Well, he is an outcome of his parents’ keen observation and support, Mohammad and Fatemeh Hossieni. One day when Mohammad returned home from work he casually put out his finger for Arat to hold, the little one just like a normal child caught his father’s finger but what happened next came off as a surprise for the man. The then 2-year-old toddler grasped his Father’s finger and lifted himself off the ground. Now, this could sound like a common act to any of us but Mohammad did not consider it to be one. Young children are high spirited and with that said they can twist and turn with immense energy at any hour of the day. This is when Mohammad started paying attention to the flips Arat did as a kid and soon he knew his son had an ability he could hone. Arat’s Instagram handle, arat.gym has some of the most astounding videos and has more than 690,000 followers from across the world. In his clips over the internet you may see him climbing the wall, performing balancing Yoga poses, flips, hand stand and similar works of gymnastics. As a spectator of the incredible kid it brings us all to one question, how does Arat Hosseini undertake such startling acts? Arat’s power and calisthenics are ineffable and his journey from being just another super active kid to a gymnast fanatic is indescribably amusing. Well, I am sure at this age he may not realize the sensational wave of fitness goals he’s been passing across the world but we along with his parents really hope he considers syncing his mind and actions to make a mark in the fitness world. Now, isn’t that amazing? Fitness is all about passion, the more you put your mind in it the better results you will see… And, when you actually begin to get the reward of your thoughtful hard work, being fit is going to act like a drug you will never be able to get over… So, how about taking an initiate today? Stay Fit, Stay Healthy! No Time to Hit the Gym? What is the Definition of HEALTHY EATING?